In October, 1914, two years into their marriage, Leonard and Virginia Woolf decamped to Richmond-upon-Thames, a tranquil town that spills down the side of a steep hill until its sprawl is halted by the encircling river. Virginia, aged thirty-two, was particularly fragile having barely survived a bout of melancholia brought on by the stress of completing her first novel, The Voyage Out. Leonard hoped that a fresh start at a safe distance would save her from the destructive whirl of bohemianism. How extraordinary. I am thirty-two, and I too have just arrived in Richmond with my husband of four years, rucksacks on our backs and buzzing with excitement. It is our first visit, but fired up with the daring that accompanies relative youth, we decide to live here with the ease that one might chose between having a coffee in a Costa or a Starbucks. We start a new chapter, eighty-four years almost to the moment after Leonard and Virginia arrived in our new home town. We are daring, but not foolish. We want to get the measure of the place before anchoring ourselves too firmly, and look for signs that read ‘to let’ and not ‘for sale’. Virginia was wary too. Although it had nearly done for her, she missed the maelstrom of Bloomsbury life and feared that she would soon tire of the tranquility prescribed by Leonard. They took lodgings at 17, The Green, a lovely Georgian townhouse with a distinctive Dutch gable that lifts it above its neighbours. We walk past it on our way to The Cricketers, seven doors down. Our temporary home is close by: a modest apartment located eighty-four years and five minutes’ walk away in a starter development that overlooks the District line, the link that kept Virginia plugged into the hedonism of London. Virginia loved to walk; she spent happy hours exploring the contained beauty of Kew Gardens or the rugged antiquity of Richmond Park, or strolling along the tree-lined banks of the Thames as it unwound around these vast green spaces. As winter closed in, the couple sank into the comfort of their first floor drawing room, and read companionably as the soothing pops and hisses of a roaring fire filled their silence. At breakfast, their Belgian landlady, Mrs. Le Grys – who Leonard described as, ‘an extremely nice, plump, excitable flibbertigibbet, about 35 to 40’ – would chat through the menu for the day with a much recovered Virginia. On January 25, 1915, the day she turned thirty-three, Virginia agreed to three things: to take a lease on Hogarth House, to buy a printing press, and to acquire, ‘a bulldog, probably called John’. We stay too, and buy an airy, inter-war apartment on the very same road, after it has morphed from Paradise to Sheen. Their new home was the right-hand side of a divided Georgian country house; from her attic window, Virginia could see the pagoda in Kew Gardens. Two tumultuous years passed before the printing press arrived, but ‘John’ remained notional. The move did not go smoothly. Theirs that is, ours is fine. Virginia fell dreadfully ill, and was hospitalised when her errant mind took to conjuring up terrifying hallucinations. In April, she moved to Hogarth House, accompanied by four private nurses, two by day and two by night. She lay in bed, ‘listening to the voices of the dead’ or watching the sunlight, ‘quiver like gold water on the wall’. At times she was demented, lashing out and babbling incoherently. Wartime air raids terrorised Richmond two decades before our block was built – the Belgian munitions works in Clevedon Road providing an attractive target. Leonard and Virginia retreated to their cellar, where they perched uncomfortably on wooden boxes, clutching torches in unsteady hands as they listened to the whine of the sirens, the screech of falling bombs, and the ‘at-at’ response of anti-aircraft fire. Virginia recorded it all in her diary. ‘the work of ages, especially when you mix the h’s with the n’s, as I did yesterday’. ‘exciting, soothing, ennobling and satisfying’. Satisfying too was the editorial freedom that allowed the Hogarth Press to print only those books that, ‘the commercial publisher would not look at’. As Two Stories – their first publication, which contained: ‘The Mark on the Wall’ by Virginia Woolf, and, ‘Three Jews’ by Leonard Woolf – rolled off the presses, they saw that the ink had adhered unevenly– thick in places and lacking in others. A failure to proofread allowed a plethora of misspellings and poor punctuation to slip through, but the title page bore the imprint ‘Hogarth Press, Richmond 1917’, and a brand new publishing house was born. 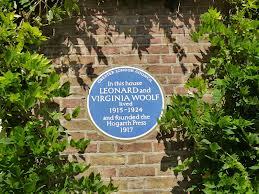 During the seven years that the Hogarth Press operated out of Richmond, sixteen of the thirty-two books published were printed by Leonard and Virginia. These included Kew Gardens, Virginia’s delightfully vibrant evocation of one of her favourite local haunts. The Bloomsbury set provided plenty of material, and the couple turned work away, rejecting T.S. Elliot’s suggestion that they publish Ulysses by a young Dubliner named Joyce. Early success allowed them to buy the building, reuniting its divided halves. On January 23, 2001, two days short of Virginia’s birthday, I give birth to a tiny, perfect baby boy. I love my London child, but parenthood triggers my own descent into despair. I have never felt as lost and lonely as I do during those days when I push a pram along streets that once held so much joy. Brought low by isolation, and long, empty days spent in the company of a newborn, I spiral down, gripped by debilitating panic attacks that trick me into believing that I am dying and that no-one else will care for my son. This, despite the fact that my capable and loving husband, who takes over at night and on week-ends, is a twenty-minute train ride away and constantly at the end of a phone line; anxiety cannot easily be rationalised away. I leave Richmond, no longer able to trust myself to be alone with my little one. I close the door on our lovely garden flat, and walk past Leonard and Virginia’s old home on my way to the train station. I will never live here again. I feel so connected to Virginia. She looms large and I am minute in her shadow, yet I have shared her suburban existence. I would treasure a tiny measure of her brilliance – she burned so very brightly – but I will settle for the modesty of my own talent as long as I can keep hold of the equilibrium that returned to me but eluded her so cruelly. 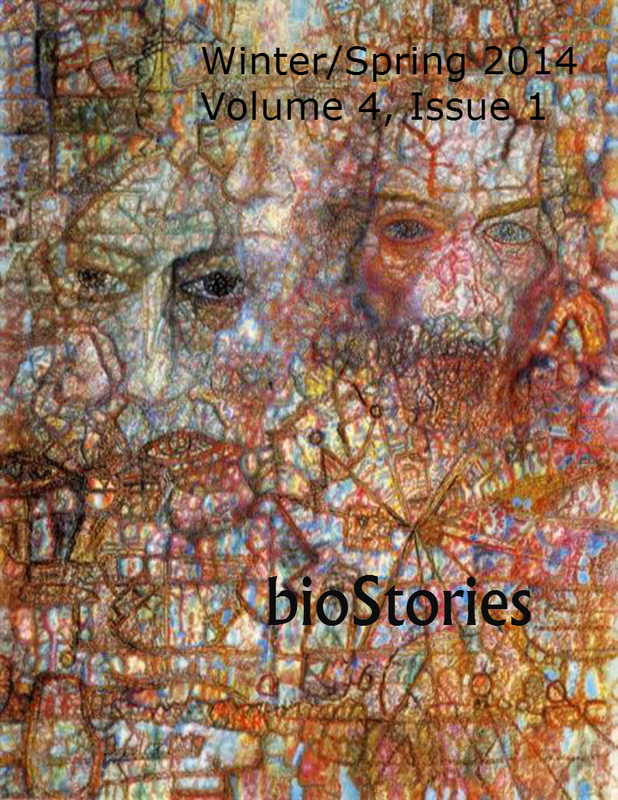 I was delighted to be named a finalist in the Biostories Essay Contest. The theme was kindness and I wrote The Kindness of Oscar and Thomas, which deals with Oscar Wilde’s time in Reading Jail. I think the winning entry, The Old Spiral Highway by Liz Olds, is lovely. The other finalist, Julie Goodale has written Escape, a very powerful and evocative piece. Both are well worth reading.